The Agency on Aging Northeastern Illinois is seeking input from stakeholders (service providers, older persons, family caregivers and grandparents raising grandchildren, Advisory Council members, members of our Board of Directors and other constituents) to help us assess the availability of services in your community and to address unmet needs. 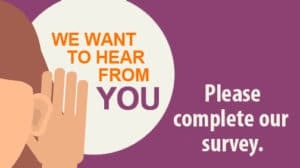 Please complete the survey below by Monday, April 22, 2019. You may complete the survey more than once for different counties that you live and/or work in. We thank you for your input and in assisting us to improve our services in the communities we serve!